What Principles Should Be Used To Assess Wellington Transport Proposals? The Ngauranga to Airport Governance Group has completed the first phase of the Let’s Get Welly Moving process, and is now calling for proposals on proposed transport solutions. But what principles and what process will be used to assess those proposed solutions? Given NZTA’s approach to the Basin Reserve flyover project, in which the movement of cars was prioritised above all else, it’s vital that the assessment process acknowledge that moving cars from Point A to Point B is neither the only, nor the most important, priority. THAT transport solutions at the Basin precinct are developed as part of tangible steps to reduce the City’s carbon footprint. THAT the cultural, heritage, recreational and amenity values of the Basin Reserve precinct are protected and enhanced. THAT public access to and use of the Basin precinct is preserved and improved. THAT access planning balances the needs of all transport flows – walking, cycling, and public transport, as well as private vehicles. THAT public access and traffic improvements are robustly informed. THAT the focus for improvements start with simple at-grade solutions. THAT conflict between different access modes is minimised. THAT a transparent and replicable approach is adopted to the sharing of data and information, enabling all parties to understand bring expertise to the table. THAT alternatives / future options are kept open (future proofed). Principles 1 and 9 are of particular note. With the Government now having committed to greenhouse gas reduction targets under the Paris Agreement, and with Wellington City Council’s recent CEMARS certification, it is now even more critical that whatever solution is developed needs to actively contribute to meeting greenhouse gas emission reduction goals and targets – and should certainly not make greenhouse gas emissions worse, for example by inducing traffic. As for Principle 9, the rapid changes in both transport behaviour and transport technology to which attention was paid at the Basin Bridge Board of Inquiry, have since continued and intensified. This means that this would be a particularly bad time to be committing Wellington to major new roading infrastructure that might rapidly become a stranded asset. This provides further support to Principle 6, which is where we believe the focus for solution development in and around the Basin precinct should be placed. It’s been a quiet first few months of 2016, at least in the public eye, as far as post-Basin Reserve flyover transport planning for central Wellington goes. But a burst of articles, presentation and comments in the media signal that this intermission is almost at an end. Before this post-Christmas intermission, the previous act finished with the drama of the defeat of the New Zealand Transport Agency’s appeal to the High Court, and the news that the Ngauranga to Airport Governance Group, consisting of representatives from Wellington City Council, Greater Wellington and NZTA, had been given official responsibility for determining what should happen next. In December, representatives of Save the Basin and a number of other groups involved in the High Court action met with the Governance Group. Since then, at least in public, the curtain has been down on developments. But now the players are taking their positions and the next act is about to begin. We understand that a public engagement process designed by the Governance Group, which we hope has taken into account input from Save the Basin and other community groups, will be launched in April. After Andy Foster had a quick say, Ngauranga to Airport programme manager Jim Bentley made a presentation to Wellington City Council earlier this week. In its article reporting on this, the Dominion Post repeated two common errors: firstly, it assumed that an expensive piece of infrastructure was needed to “fix” congestion at the Basin, and second, it assumed that congestion in central Wellington’s roads stemmed from the Basin itself. In Wellington Scoop, Lindsay Shelton succinctly debunks both arguments. The Transport Agency themselves have said that incremental at-grade (ground-level) improvements can be made around the Basin – while we believe a wider engagement process is necessary, we support short-term incremental improvements as well. There are grounds for hope that NZTA may be moving away from the “bigger is better” approach that has bedevilled their transport planning in the past. A focus on making simple, readily affordable changes around the Basin would be a good start – and you can see what other steps we proposed for the Basin in the aftermath of the High Court decision. 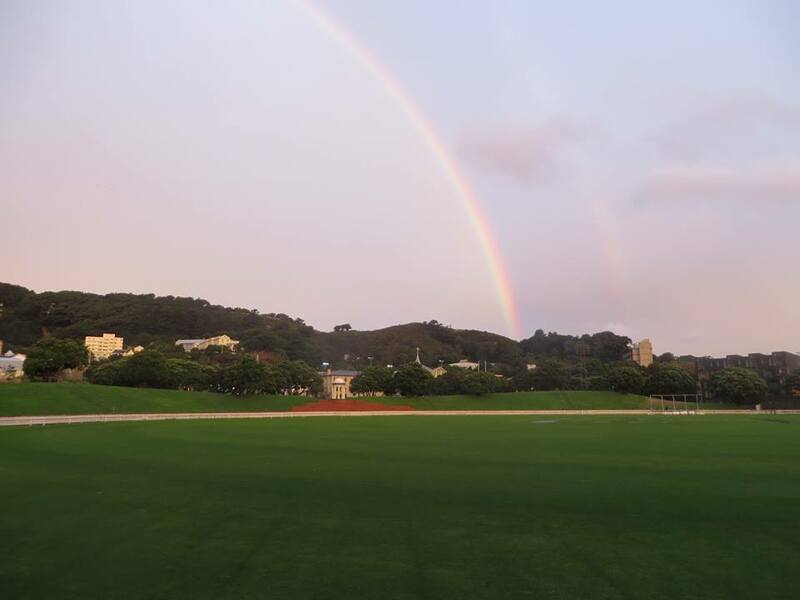 Basin Reserve rainbow. Photo: Patrick Morgan. Save the Basin’s feature article on post-flyover next steps appeared in the Dominion Post last Friday. The core of the article is this seven-point plan of next steps at and around the Basin. This has received a good reception so far, but we’re still trying to get to grips with the consultation process on post-flyover options. We’ve been told that it will be open and consultative, but it remains shrouded in secrecy so far. Reframe the Basin as a sporting, urban development and heritage area as well as a transport corridor. The politicians and the NZTA need to grab the opportunity to engage the community in thinking about the future of the Basin and its surroundings. Create a master plan for the whole area. Its national significance needs to be given appropriate recognition: instead of seeing the Basin, Pukeahu National War Memorial Park, the Governor General’s residence, numerous local schools and the heritage of Mt Victoria as isolated pieces, the rich history of the whole area should be celebrated. Go through a robust process to evaluate which of the transport options highlighted by the Board will have the most benefits. Start by carrying out small improvements to bring relief to frustrated transport users, and evaluate these before considering whether a more expensive option is justified. .
Upgrade the Basin and strengthen and preserve the Museum Stand. Prioritise a Reserve Management Plan for the Basin (as already agreed by the City Council) that will establish key principles on how the ground should be preserved. Put in place heritage protection for the whole ground in the City Council’s District Plan. Re-develop Kent and Cambridge Terraces as grand public and private spaces well connected to the Basin – which could include uncovering Waitangi Stream that flows between them. Cancelled the Notice of Requirement (NoR) for the construction, operation, and maintenance of State Highway 1 in Wellington City between Paterson Street and Buckle Street/Taranaki Street, and to construct (and where necessary operate and maintain) work that avoids, remedies or mitigates adverse effects. Declined the resource consent applications. In other words, they turned down the flyover proposed to them by the New Zealand Transport Agency. Parties (including the applicant and submitters) now have until 19 August to submit comments on any factual errors they find within the draft report, and the Board will release its final decision by Saturday 30 August. Parties then have the opportunity to consider making an appeal on matters of law. Not surprisingly, there was a flurry of media reaction when the decision was announced – far too much, in fact, to link all of it here. You can get a good flavour by following the flyover coverage categories in Wellington Scoop and in the Dominion Post. Patrick McCombs’ article Pain, Cost and Embarrassment … Because the Transport Agency Didn’t Listen does a great job of highlighting the many deficiencies of NZTA’s case, and the sloppy arrogance with which the Transport Agency approached the Board hearing. July 22 (after the decision was announced): Surprise, surprise, SURPRISE: the answer is NOT a flyover! Given previous Boards’ track record of approving Government proposals, it’s understandable that many people were surprised at the decision. What’s less understandable is the failure of a number of local business and civic leaders to either accept or adapt to the situation. Plainly, many flyover supporters had proceeded on the assumption that the project would be rubber-stamped. The weeping, wailing and gnashing of teeth extended from Kirkcaldie and Stains to certain inhabitants of various Council chambers. Well, here’s some news for the Chicken Littles of Wellington: the sky isn’t falling, and contrary to what a number of local and national politicians have said, there is a plan B – in fact, several other options are on the table and were taken seriously by the Board in its report. So. Options are on the table. Pending the final decision, a flyover isn’t one of them. It’s time for an open, reality-based discussion about what happens next. Wellington has got a very good thing in the form of the Basin Reserve. But sometimes, as New Zealanders, we have a tendency to undervalue what we have. McCredie told the four-member board the Basin Reserve was currently one of the most stunning entrances to a city you will find anywhere in the world. Putting a flyover beside it would devastate Wellington’s reputation as a walkable city because it would instantly put tourists off moving through the Basin heritage area, she said. It would also destroy one of Wellington’s major architectural points of difference on the world stage. Jan McCredie had a lot more to say about the negative effects of the proposed flyover on pedestrians and visitors to Wellington, and she threw her weight behind the alternative Basin Reserve Roundabout Enhancement Option (BRREO), which involves only at-grade (ground level) changes. The transport agency was kidding itself if it thought the flyover as an “elegant” bridge, she added. Let’s value what we have. Let’s not destroy it with an unnecessary, ugly and expensive one-way flyover. Last week was quite a week for the campaign to stop a motorway flyover being built at the Basin Reserve. Events happened so rapidly that we never got round to covering them here, so here is a quick recap of the week. It had been evident for some time that the Basin “Bridge” Board of Inquiry was not going to meet its original, or even its revised, timetable. To their credit, the Board wrote to the minister and asked for an extension, which the Minister has now granted. The Board was due to present its final report on 31 May. It now has until 31 August to report, which means that its final report, and any consequent legal action, will be happening around the time of the General Election. Subsequent to this decision, the Board released a revised draft hearing timetable. If you are a submitter who is making an oral submission, someone calling witnesses, or an expert witness, make sure you check this timetable and the further changes that have already occurred. Some submitters have already found that they have been scheduled to appear twice. Most individual submitters will now be scheduled to appear on Fridays. Due to the extension, there may also be a change in the hearing venue, which is currently the Amora Hotel. At the Basin Reserve flyover Board of Inquiry, NZTA’s Wayne Stewart has been forced to admit that planning has been done for a second Basin Reserve flyover. The currently proposed flyover would be a one-way road going from east to west – that is, from the Mt Victoria tunnel towards War Memorial Park. Under questioning from the Board of Inquiry, NZTA have confirmed that they have done planning for a second flyover going from west to east. Richard Reid, appearing for the Mt Victoria Residents’ Association, has previously raised the concern that one flyover would soon lead to another. Despite NZTA’s attempts to minimise the issue, it has been placed firmly on the table at the Board of Inquiry hearing, which has been told by NZTA’s Wayne Stewart that in 2010 the agency looked at duplicating the War Memorial Park tunnel and building a second flyover at the Basin going from west to east. “Lines were drawn on a map,” he is reported as saying, though he claimed planning had not gone any further. As Richard Reid has noted, if NZTA gets approval for its present one-way flyover proposal, it will be much harder to fight a proposal for a second flyover. So one flyover could well bring a second in its wake. I think we know what tends to happen once NZTA starts drawing lines on maos – unless they are stopped now, before any further damage is done. Opponents of NZTA’s proposed Basin Reserve flyover have said all along that NZTA behaved in an arrogant and high-handed manner during the supposed “consultation” process on its Basin Reserve flyover plan. Now that arrogance and high-handedness has come back to bite NZTA – and it’s not just us saying it. This expert witness also says the “grossly uneconomic” flyover will cause significant adverse environmental effects and he asks why the Agency is understating environmental issues related to the flyover. As a campaigner, it can be easy to feel like a lone voice in the wilderness. Not any more! We knew the NZTA’s plans to build a flyover at the Basin Reserve were fatally flawed. Now several days of highly critical media coverage, with pictures of what a flyover would look like if NZTA’s plans go ahead, mean that a lot more people can see these flaws. What’s more, it’s a peer review panel of experts that has been the source of much of the criticism. The Emperor’s new clothes are well and truly off, and the proposed flyover’s flaws are laid bare for all to see. It takes a scathing look at the inadequate or nonexistent analysis underlying the Government’s Roads of National Significance plans for the Wellington region. It does list the proposed Basin flyover as one that has a mooted Benefit-Cost Ratio of greater than 1, but a little more digging would have revealed that the Basin BCR is only greater than 1 because NZTA rejigged their calculations to make it so. When even such mainstream figures as Gareth Morgan are calling for a rethink, the Government and the relevant local authorities ought to see that they have a real problem with roading policy.